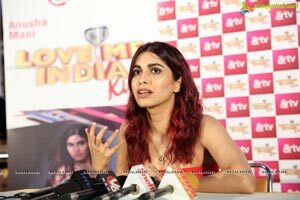 Hyderabad, August 11th, 2018: The contestants of &TV's Love Me India Kids, a live singing reality show for kids are all set to make their way into the hearts of millions. An original format developed by Essel Vision Productions, the contestants of the show are divided into four zones: North, South, East and West. Each zone will comprise a talented bunch of contestants aged between 5-15 years and have a zonal captain to mentor them. Launching the battlefield amongst the zones for the very first time, the show hosted a special music concert in the city of Hyderabad introducing the 20 South zone contestants. Joining hands with them in putting up a spectacular live performance was the captain of the zone and an exceptional singer herself, Anusha Mani. 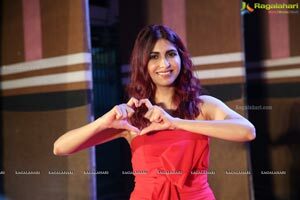 With a cheerful and hearty voice that got her the big ticket to Bollywood, Anusha along with her talented team of kids mesmerized the audience, while they crooned to some of the most loved songs of the nation. Anusha made her grand entry with one of her biggest hits 'Gulabo'and ended the evening with a real bang by giving a spectacular performance on the song ’Bang Bang'along with the little contestants. Held at Shri Sathya Sai Nigamgamam, music lovers witnessed an evening full of electrifying and breath-taking performances by the singing superstar. 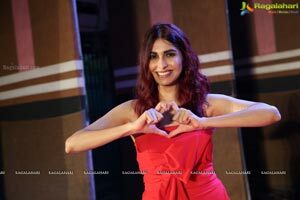 Thrilled about performing live on stage, Anusha Mani said, "couldn't have asked for a better welcome than the one I got from this lovely city of Hyderabad. Although I wasn't performing in the city for the first time, but this has been one of my best concerts by far. The excitement and enthusiasm that we received from the audience was unbelievable. The contestants of my zone were as enthusiastic as I was to perform in this city and the crowds cheered us through. 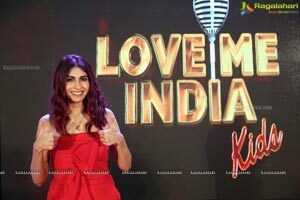 With the kind of talent, they have hidden with them; I think mentoring and singing along with them on Love Me India Kids is going to be a really splendid journey. I look forward to returning to this city and hope to charm them once again." 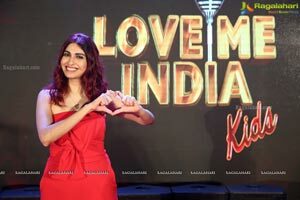 Creating an edge for itself, Love Me India Kids raises the bar on interactivity amongst the audience, by engaging with its viewers on a real-time basis. From being able to choose their favourite contestants prior to the show going on air to owning a higher weightage of votes over the judges, the show will truly make every single audience vote count. With intense competition in the air, each zone along with their zonal captain is geared up to give each other a tough fight. While the East zone will be headed by the versatile singer Bhoomi Trivedi, the famous Maharashtrian singer Abhijeet Sawant, along with the robust voice Navraj Hans will be seen reigning over the West and North zones respectively. The show will see a grand take off with each zone making their entry on the dazzling stage, while being welcomed by the esteemed panel of judges. 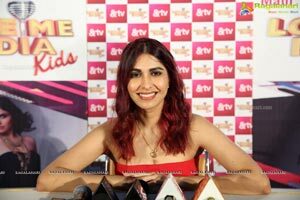 Stepping in for the first time into the judging territory is the Punjabi pop sensation Guru Randhawa along with the soulful singer, Neha Bhasin. With aflair in judging several reality shows, Himesh Reshammiya will also be seen as a judge and evaluating each zone on various aspects. Join us in this journey, as India chooses its next singing superstar with Love Me India Kids. About &TV: &TV is the flagship Hindi GEC amongst the bouquet of channels from Zee Entertainment Enterprises Limited (ZEEL), a global media and entertainment company. Staying true to the personification of the TV signifies a conjunction of aspirations and rootedness which is synonymous with the spirit of New Age India. Through its content offering, the channel brings together people and ideologies thus fostering cohesive viewing within Indian households. &TV showcases a diverse and dynamic mix of relatable fiction, high voltage non-fiction, marquee events and blockbuster movies. The channel is available in SD and HD across all Cable and DTH platforms and enjoys a leading presence in international markets including Asia Pacific, Europe, the Middle East and Americas. The channel, viewed by premium audience is fast gaining popularity across territories.